Our constantly updated facilities include a Music School which was extended in 2012, state of the art classroom blocks and a modern re-furbished theatre. Sixth Form students have their own Sixth Form Centre and common room in the newly built Wells Centre which now boasts a super new coffee bar. Our School Chapel, with its fine 3 manual pipe organ, accommodates full school assemblies. Our Sports facilities boast a full-size Sports Hall which includes a Fitness Suite, Dance Studio, Martial Arts Studio. The excellent floodlit newly re-relaid artificial turf pitch provides an excellent playing surface for hockey, football and tennis all year round. The recently resurfaced tennis and netball courts sit amongst open countryside. Rounders is another popular outdoor sport which enjoys the open spaces of our extensive playing fields. Footballers have use of the nine full sized football pitches and three five-a-side or training areas. Keen cricketers also enjoy the use of the three grass wickets and an artificial wicket plus five indoor, two all-weather and six grass nets for training. Budding sailors can perfect their skills at Aldenham Sailing Club in the nearby Country Park. Within the School Sailing Club in our fleet of six 420 boats and two Firefly Boats there is room for those who are competitive and wish to race as well as for those wishing to learn a new sport and skill set. Aldenham has three mini Basketball courts and one full sized court with an electronic scoreboard. The game is available for seniors (Year 10 upwards) with fixtures against Felsted, Haberdashers’, Merchant Taylors’ and Bedford. Golfing enthusiasts can hone their skills on the five all-weather driving bays on site. There are two school teams that play in several regular events including the ISGA match play schools’ competition. We also run an academy for potential golfers (by invite only) in the summer term with two local professionals providing lessons. Dance is popular for boys and girls in Year 7 & 8 and is offered as a GCSE subject in Year 10 & 11. The annual School Dance Show is a highlight in the School calendar. We are fortunate to have six Fives courts where specialist coaching takes place throughout the year with main fixtures against schools such as Eton, Westminster, Highgate, Mill Hill, Berkhamsted and RGS High Wycombe. By constantly updating our facilities, Aldenham is in good heart to continue to be faithful to our founder's intent to enable pupils to progress in "learning, knowledge, virtue". An unpressurised environment such as this makes for some of the most contented pupils we have met." Educating children in Hertfordshire for more than 400 years, the Aldenham Foundation encompasses Aldenham Senior School for boys & girls 11-18, Aldenham Prep School (boys & girls 5–11), Aldenham Nursery (boys & girls rising 3-4), St Hilda's Prep School (girls 4-11) and Bluebird Nursery (boys & girls 2-4). 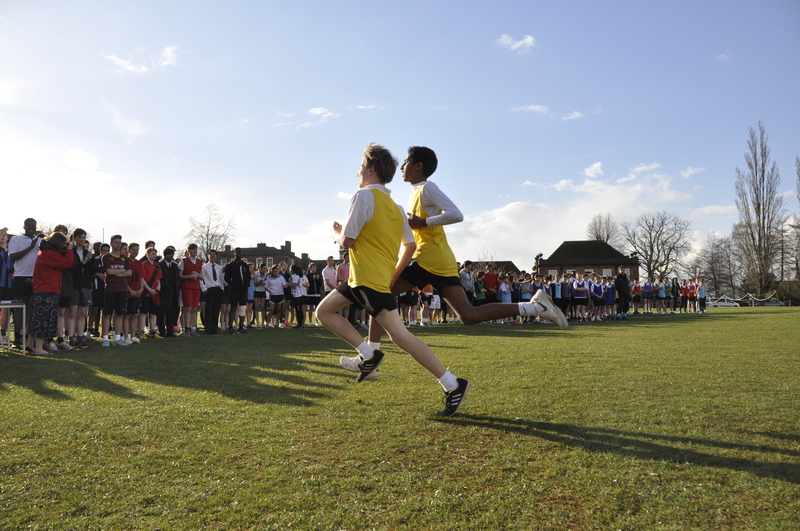 Aldenham School offers outstanding Boarding / Day options for boys and girls in a caring community. Set in a beautiful site of 110+ acres of green belt land within the M25 and close to the main London airports. Pupils enjoy an excellent all round education with room to express their individuality. Academic and social activities are given equal importance for the development of valuable life skills. At Aldenham Nursery and Aldenham Prep School we provide a happy, nurturing and warm environment where quality learning takes place and the needs of each individual child are fulfilled. Aldenham Prep School is a caring school where boys and girls from 3 to 11 develop and thrive. On the same glorious site as Aldenham Senior School set in 110 acres of countryside and with excellent facilities. St Hilda’s is a community of girls aged four to eleven years, whose infectious enthusiasm, politeness and busy purposefulness is immediately evident to visitors. The girls thrive in a caring yet challenging environment, which teaches them to be resilient and resourceful learners, and ultimately to be exceptionally well prepared to take their next step to the senior school of their choice. Our youngest children aged 2-4 years are encouraged to play, explore and learn, under the watchful and inspiring care of specialist staff. Our packed programmes of teacher and child-led activities are especially designed to develop the whole child in ways appealing and appropriate to their current age and stage, including specialist teaching in subjects such as dance, music, swimming, PE, French and Spanish.